Adopting a child from another country is referred to as intercountry adoption. Intercountry adoption is a two-step process; first, the adoptive parents must legally adopt the child. When this occurs, the adoption must be authorized by the adoption authorities present in the home country of the adoptee. Once the child has been legally adopted, the adoptive parent(s) can proceed with the immigration and citizenship process to legally bring their child back to Canada. It is important to note that these steps must be completed in this order. Applicants cannot begin the immigration or citizenship process until the adoption has been approved by both the parent’s province or territory and the adoption authority of the country that the child is being adopted from. The adoption process can be lengthy, especially when coupled with the immigration or citizenship processes. The amount of time it takes to adopt a child from a foreign country differs depending on the child’s country of origin. As such, the process could take two or more years to complete. Citizenship Canada processes adoption cases on a priority basis. This means that those cases in which a child is facing health or safety concerns may be processed ahead of other cases. Visa officers are also rigorous in their efforts to bring adoptees to Canada in a manner that prioritizes the interests of the child and ensures there is no evidence of fraud or trafficking. 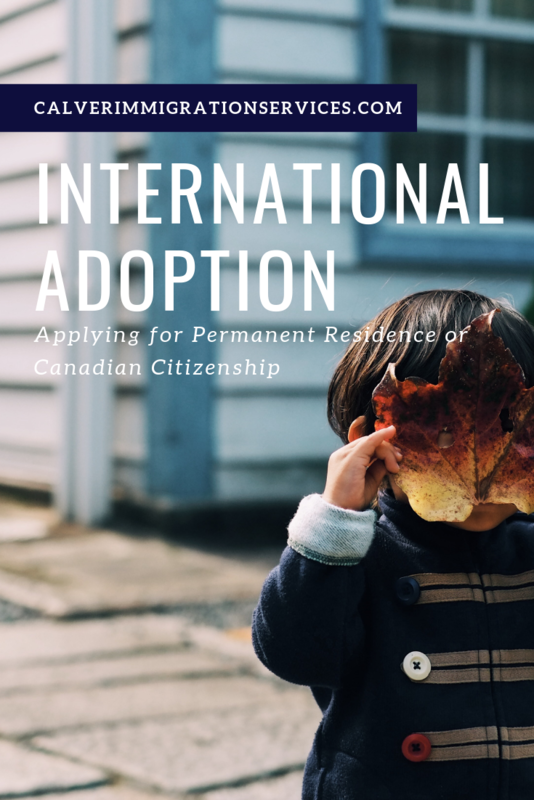 Once the adoption process is authorized, parents must decide whether they want to apply for permanent residence or Canadian citizenship for their child. There are a number of factors that are involved in making this decision. One common deciding factor is whether or not the country the child was adopted from recognizes multiple citizenships. If they do not, parents may opt for Permanent Residence. Adoptees with Permanent Resident (PR) status would have the opportunity to choose which country they would like to maintain citizenship of once they become an adult. In other words, those deciding whether or not to apply for PR for their child should know that their child will have the option of becoming a Canadian citizen later on. Children who become Permanent Residents of Canada first will be able to pass along their citizenship to any future children they have in their native country. They may also apply for a grant of direct citizenship for children they may later adopt abroad. Adoptees acquiring citizenship directly will not be able to do either of those things due to the first-generation limit unless they marry a Canadian-born citizen.